More than 600 Phanouropita were blessed at the Great Vespers service in the evening of August 26, 2011 at the Monastery of Saints Adrian and Natalia in Argos in the municipal district of Saint Adrian, as the priest read hundreds of names to pray for the health of friends and family of the offerers. The primary reason people present Phanouropita on the feast of St. Phanourios on August 27th is because of their great love for the Saint, and also to fulfill any vow they may have made after seeking the intercession of this Newly-Revealed Great Martyr. 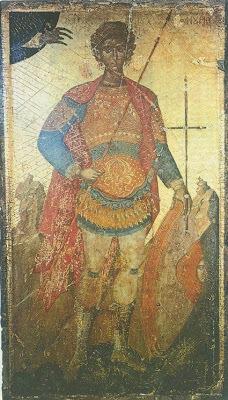 Little is known of the Great Martyr Phanourios, except that which is depicted concerning his martyrdom on his holy icon, which was discovered in the year 1500 among the ruins of an ancient church in Rhodes, when the Muslims ruled there. Thus he is called "the Newly Revealed." The faithful pray to Saint Phanourius especially to help them recover things that have been lost, and because he has answered their prayers so often, the custom has arisen of baking a Phanouropita ("Phanourios Cake") as a thanks-offering. As a patron for those who have lost something they are searching for, the source of this custom is etymological (Phanourios means "Revealed"). In other words, "the Revealed reveals!" (Ο Φανούριος φανερώνει!). The fact that his name has such an etymology and the nature of the discovery of the icon of this previously unknown Saint gave rise to the custom of the Phanouropita as a thanks-offering for helping the faithful find things. The veneration of St. Phanourios originated in Rhodes, where his icon was discovered. From there it spread throughout Greece, especially to Crete where today there are three monasteries and dozens of churches named after him. In places like Cyprus and Crete it is a tradition for the young women to bake a Phanouropita in order for St. Phanourios to help them find a husband. In Skiathos a Phanouropita is baked by a woman who wants a husband revealed for her daughter. In Florina unmarried women receive a piece of Phanouropita after the Divine Liturgy and place it under their pillow, hoping to be revealed in their dreams something about their future husband. Primarily the Phanouropita is a lenten cake which is a custom that has its source in being a gesture of reverence for the Saint. It is made with seven or nine ingredients. These are considered sacred numbers and the choice of these numbers is not by accident. Read more about St. Phanourios here.